Environmental scanning electron microscopy (ESEM) (1) is an imaging technique which allows hydrated, insulating samples to be imaged under an electron beam. The resolution afforded by this technique is higher than conventional optical microscopy but lower than conventional scanning electron microscopy (CSEM). The major advantage of the technique is the minimal sample preparation needed, making ESEM quick to use and the images less susceptible to the artifacts that the extensive sample preparation usually required for CSEM may introduce. Careful manipulation of both the humidity in the microscope chamber and the beam energy are nevertheless essential to prevent dehydration and beam damage artifacts. In some circumstances it is possible to image live cells in the ESEM (2). 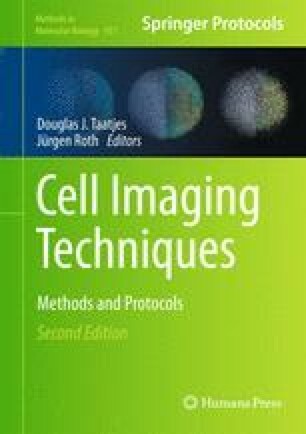 In the following sections we introduce the fundamental principles of ESEM imaging before presenting imaging protocols for plant epidermis, mammalian cells, and bacteria. In the first two cases samples are imaged using the secondary electron (topographic) signal, whereas a transmission technique is employed to image bacteria. The authors wish to thank T. W. Fairhead, D. J. Stokes, D. Waller, J. N. Skepper, A. Grant, Z. Wang, C. ffrench-Constant, A.A. R.Webb, P. J. Franks, and A. Luzhynskaya for their involvement with the development of these techniques. These protocols draw on the authors’ experience working with E. coli bacteria and monocyte-derived macrophages. Category 1 samples are defined in as being unlikely to cause human disease. Bacteria were prepared in appropriate laboratory conditions. Samples were sealed in falcon tubes which were then sealed inside a further plastic container for transport to the microscopy suite. Handling was broadly similar to that described above. However, liquid samples had to be transferred by pipette from the falcon tube to a glass slide or TEM grid for imaging. Here, care was taken not to create aerosols and pipette tubes or tips were disposed of with other waste after use, as described above. This section draws on the authors experience in handling C. jejuni bacteria, which can carry a significant health risk and are categorized as a Category 2 sample. Category 2 materials require more care in their handling and use as they can cause human disease and may be a hazard to employees; however is unlikely to spread to the community and there is usually effective prophylaxis or treatment available. The main method used to minimize the risk of infection is the use of extremely low numbers of cells—for microscopy only very small numbers of individual cells are required. However, suitable care was also required in the transport, handling, and disposal of these samples. Samples were prepared in an appropriately classified laboratory. Before using any samples, 1 day was spent there training the microscopist in the preparation and handling of these samples in order to improve techniques. Samples were prepared in this laboratory and were then double boxed and placed inside a plastic container sealed with biohazard warning tape for transport to the microscope suite where imaging would take place. Here, appropriate equipment for the handling of the materials had already been assembled. Before opening the sample, the door to the room was closed and a biohazard warning sign placed on the door. No one else was allowed to enter the room whilst experiments were taking place. A blue lab coat (elasticated at neck and cuffs) was worn while handling samples along with latex gloves. Samples were restricted to a small area of the room, working on a clear surface next to the microscope chamber. 2% Virkon solution and 70% alcohol were available at all times for cleaning as well as an antibacterial alcohol-based handwash for use between sample handling events. Samples remained sealed at all times, except when a small amount of sample was being removed for imaging. In these cases, the sample would be opened and a small quantity removed using a pipette and placed onto a glass slide already in place in the microscope, taking care not to make aerosols. Filter top pipette tips were used and these were disposed into a marked biohazard waste bin after removal from the microscope, as were gloves used during sample handling. Great care was taken to avoid cross contamination using best handling practices. If there were any spillages, they were wiped up with tissue and placed into the biohazard bin, then cleaned with 2% Virkon solution (if outside the microscope) or alcohol (if inside the microscope). All equipment was cleaned with 2% Virkon solution after use and the interior of the microscope was cleaned with alcohol. All equipment was stored sealed into a specially labeled box. The biohazard waste bin was swabbed with alcohol, double bagged and sealed using cable ties, marked with biohazard warning tape and returned to the laboratory for disposal.